the space in between: Maybe the banner was meant for them? I start this blog with a heavy heart knowing that friends in Greenpeace might be offended with opinions that will be stated here. Also I do not have any internal information as to how the recent Greenpeace action that happened in Peru, came about, so what I say here is based on what I see as an outsider to the organization who has been exposed to the public materials made available in the media and through official Greenpeace communication about the incident. I have worked for the organization close to a decade and I left because I wanted to pursue a different direction as an activist, but also because it no longer felt like the family of equals that I came to know when I joined in 2005. It became more certification driven, in fact it makes me wonder that if ever I have been an applicant to the role I had when I entered Greenpeace now, I wouldn’t probably get accepted for the role if they were to look at my professional credentials. Nevertheless, as someone who has also been a part of Greenpeace, the Nazca Lines fiasco comes as no surprise: My theory is that the organization’s thrust in recent years to professionalize1 itself requires it to open up the organization to many professionals who for better or worse are professional in their field of expertise but have lacked the vision and heart to see their work as a vocation. Professionals who will likely spend less only 6-10 months at a given office detached and uninterested with the work, the kind that's present on meetings but never on activities (action or otherwise); professionalism that doesn't go beyond office hours or on weekends; has an expertise in skills but lacks heart or interest in the issues Greenpeace works in; present stirring up structural changes backed with data on how we can supposedly increase our effectivity in terms of media coverage and online-to-offline conversion rates. That is not to say that everyone at Greenpeace, is like that, I have many friends inside Greenpeace who would still be critical enough during the planning process of the action to consider factors that makes a direct action impetus to achieving objectives that make a difference in real world situations and if convinced would be willing enough to risk their lives, limbs and liberty in a heartbeat in a direct action. However, professional activists (if ever there was a word) cast a greater number, and they are the ones who seem to steer conversations about strategy and tactics and campaign directions that if I were to look back on those conversations now reminded me of an outstanding thought which is mainly about what Greenpeace can gain out of our campaigns rather than what Greenpeace can contribute to advance our collective struggle with the broader environmental movement. As a consequence of this professionalism within Greenpeace, majority of the newer staff held no personal, emotional and ideological investment with the organizations' core values and more than 40 years of campaigning history. Looking at what has been done in Peru, reminded me of several important stuff that I think has been overlooked by the organization particularly in the process that it calls an ‘inquisition,’ which is about running the action idea to a gauntlet of scenarios so that it would be refined to be a proportionate response to an impending environmental threat but also to ensure that the action is effective and beneficial to both Greenpeace as well as to the community and ecosystems they're meant to help and represent. My years of experience makes me speculate that the gap might have been there as recent themes of brainstorming that I’ve gone through has been about identifying the ‘wow factor’ and how ‘out-of-the-box’ a campaign being proposed above anything else, because being in a constant lookout for the next big thing in activism seems to matter more than the impact it gives to meeting campaign needs. Furthermore, I think the ‘professionalism’ at Greenpeace, was more about introducing skills (which isn’t bad in itself) to the organization but lacked in the activist formation of those new-found skilled personnel about institutional history and documents that serve as written reminders about how we can do our work better. Defining a direct communication – If it wasn’t an action then maybe it was what Greenpeace calls as a direct communication, since the same document defines it as way of “communicating directly with audiences rather than via newspapers, TV, radio, etc.” To which it also cautions, that “direct communication only works well with a highly targeted audience and often fails when applied to broader targets.” Here I make the assumption that the intended audience is the negotiators for the United Nations Framework Convention on Climate Change, and with that in mind I ask the question why are they not doing that direct communication in the conference venue? Tone and cultural considerations – The same document highlights that Greenpeace as an international organization is part of the global community and that people within the organization are “citizens of the world and should respect all cultures…” Could it be possible that the thrust for a kickass photo-op overshadowed common sense of respect? Or maybe no local was actively involved or at the very least consulted in the planning process? Or maybe they did speak up, but their insights had little merit because it was not backed up by statistical data derived from an A/B tested survey sent to online supporters? Well, that is the question I leave to those directly involved in the planning of the action. Please note that I am writing this with the same guilt as well, in my time at Greenpeace I have also lent approval to the same kind of showboating and my critique is meant as a way to spark conversations about Greenpeace and activism in general so that lessons from incidents such as this would not be lost and that the stories of these mistakes would function as cautionary tales for us to be better at the campaign work we do since we have such a huge mandate in light of climate change. I am not against the ‘professionalism’ that is prevalent with Greenpeace, because organizations need to be efficient and effective at their work --they owe it to those who give them the resources to do their work, but I stand against ‘professionalism without commitment to history and solidarity the broader movement,’ that dominates the organization, and maybe it is high time that this same desire for professionalizing its activism be also about being professional enough to owe up to its mistakes and instead do something more than issue a token statement of apology, but rather pursue greater accountability within its decision making mechanisms and to purposefully facilitate discourse internally and provide greater space for dissent internally after all they ask the same thing from governments and corporations. Moreover, it may be a subtle reminder as well that organizations like Greenpeace should keep in check their ego by asking the world at large what is needed and to look at its history not merely for the purpose of nostalgia but for the purpose of finding morals within its own organizational metanarrative. The lesson to be learned here is that organizations err as all humans do because they are parts and participants of a system that interacts with cultures, economies and society in general which are products of the concrete conditions that constitute them. I am not trying to say that we should hate Greenpeace altogether, I write this because we all need to understand that civil society organizations like Greenpeace are also prone to the same tendencies that we hate about political parties, governments and corporations. And if you are a volunteer, staff and donor I urge you to speak boldly about what you feel and ask Greenpeace to heed your voices because it is to you that it owes its mandate to do well in its work. Already there are beacons of hope within Greenpeace, as I write this I have just read a moving statement from Greenpeace USA’s Executive Director, Annie Leonard, who shared our frustration and anger, and has committed to ensure “that those responsible are held accountable and that we put safeguards in place to ensure that nothing like this happens ever again.” A statement that I hope would also be echoed by the office in Southeast Asia that was formerly a part of. Also it is not worth forgetting about how Greenpeace, played a major role in many landmark environmental policy, in the Philippines alone they have been instrumental in the passing of the Clean Air Act of 1999, Ecological Waste Management Act and the Renewable Energy Law. While it has also gained much in places like Argentina where its' first federal forest protection law was brought about by more than a million signatures that was delivered to its government, and in the Amazon they together with local partners were able to secure protection for an area twice the size of Belgium. To this day it still remains true to its commitment to nonviolence in all the direct action it has conducted in its years of campaigning and yet they do not shy away from confronting the biggest environmental criminals in the planet. Lastly, their core value of financial independence still ensures our financial independence from political or commercial interests by their refusal accept money from either companies or governments which separates them from many other environmental groups whose funding compromises their position in certain ecological issues. May we all be challenged to make our actions speak louder than our words in staying true to our mandate of ushering in a green and peaceful future, because at the end of the day the real loser was not Greenpeace, nor the Nazca Lines it was all of us that is who are threatened by runaway climate change, the stunt and the ensuing backlash made us forget about the need for more decisive actions from world governments to act on climate change which was the message that was supposed to be conveyed by Greenpeace activity in the first place, giving yet another victory to the status quo of fossil fuel dependence. 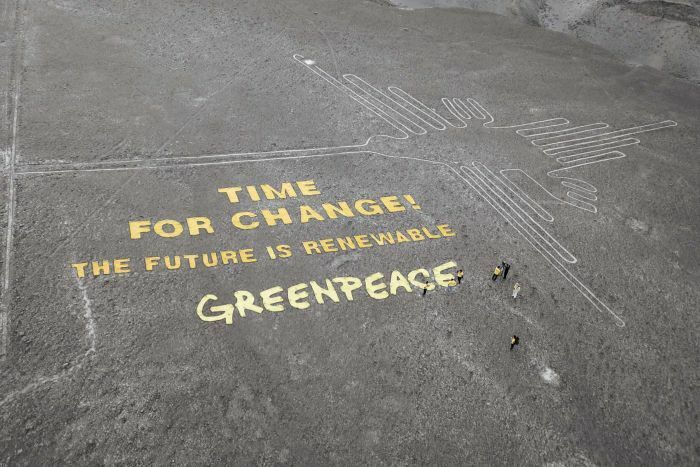 Maybe it really is a 'time for change' in focus over at Greenpeace. Well written Chuck. Passion first, professionalism second, I believe. Thanks for the comment Top, its been a long time, I haven't seen you in a while. I hope you're doing well. Ouch. But yes. You're entirely right Chuck. This is painful to deal with, and I hope we can fix this - and Greenpeace can finally learn to drop the big bad banners as a way of action. I have to disagree with you on the Shard though - the IceClimb would have sucked if it was just about a banner drop, but what it was to me was a day long story about the Arctic that captured an entire major city, and involved them in saving the Arctic. i think it's very different from a random banner drop. All of you in the GPI web team are among the few folks whom I will always look up to and will always consider myself honored to have worked with you, Andrew, Brian, Eoin and the others. I miss working with all of you. I really hope that Greenpeace will be able to rise above this crisis, renewed and wiser than before.